The default language for the Newscoop administration interface is English, but you can either use one of the many translations supplied with Newscoop, or create your own translation using the built-in Localizer tool. You can also use the Localizer to improve an existing translation, or adapt it for a regional dialect. The first step is to check that the language you wish to translate into is listed on the Languages page, found on the Configure menu. If your target language does not exist there, you will have to add it to Newscoop first. See the chapter Languages for details. After that, you can open the Localizer by clicking Configure, then Localizer on the main navigation menu. The Localizer works by enabling you to translate individual strings of text that appear in the Newscoop administration interface. There are 2463 strings in the whole of Newscoop, divided into 40 areas representing the various different pages of the interface. You can complete a localization with a team of translators working together, by tackling one area each at a time. 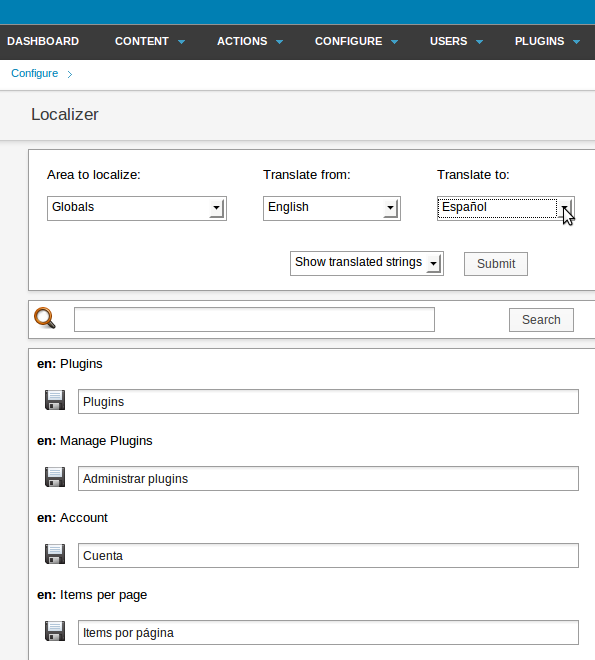 Select your source (Translate from) and target (Translate to) languages from the drop-down menus, and then select an Area to localize, such as Geo-location or Article Types. Areas that have not yet been fully translated are shown in a red font. You can save your work at any time by clicking the disk icon next to one of the input fields. When you have completed your translation, there is a Save button at the end of the page. You will encounter strings with a dollar sign in them, e.g. "$1". This means that one or more words will be substituted by Newscoop in place of these characters. 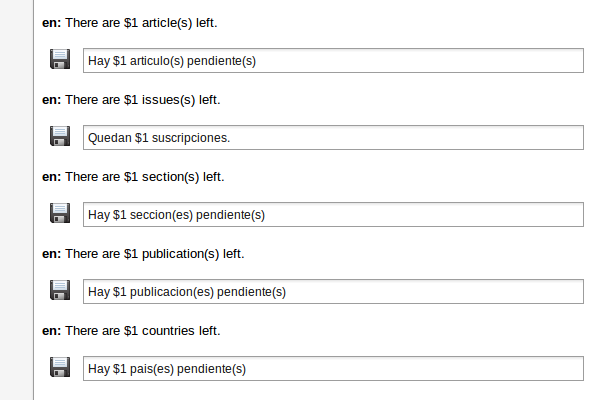 For example, the string "Signed in: $1", when displayed in the Newscoop interface, might be: "Signed in: Administrator". In this example, the user name "Administrator" was substituted for "$1". TinyMCE, the WYSIWYG article editor incorporated into Newscoop, can also be localized. The strings in TinyMCE have to be edited manually by your system administrator, which is a task performed separately from the Localizer. We actively encourage Newscoop users to send us their language localizations. This makes Newscoop more useful for people around the world. Even if a similar language localization exists, it may not address your particular needs or regional differences. For example, there may be differences in Spanish between the language used in Spain and that used in Guatemala. In that case, you can localize Newscoop to your needs and share the localization with other users that speak your language or dialect.